Restaurant reviews of the various Devour Downtown Winterfest 2013 eateries are definitely a delicious part of my work. Whereas my first review was for casual, downtown pillar The Elbow Room, with its comfort-food menu, (Read review here) this second review is for an Indianapolis favorite steak spot that is giving three options for the DD foodies. 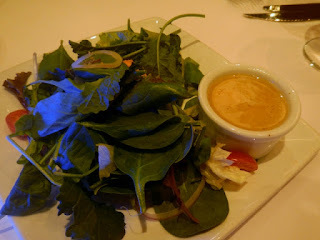 Ruth's Chris offers three separate menus this go-round with vegetarian, regular and gluten-free options. 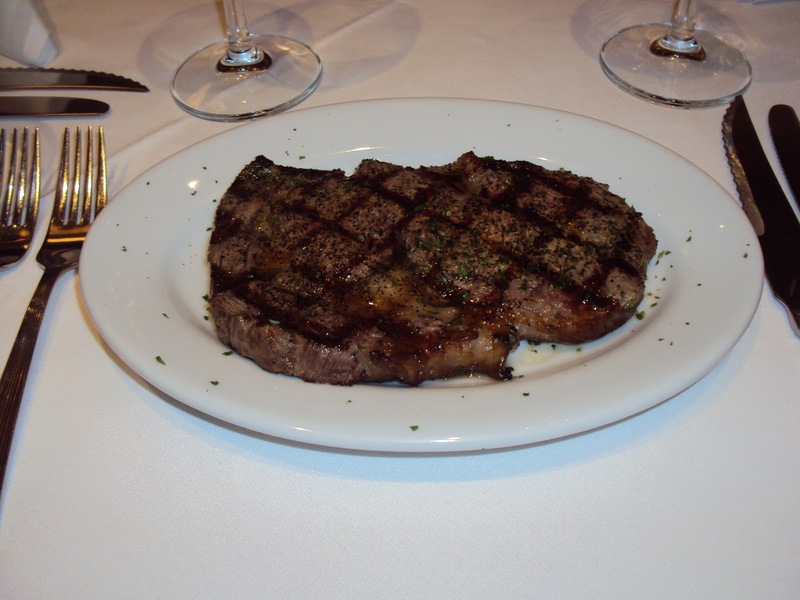 With the $35 per person reduction, the steakhouse gives choices galore, pleasing everyone's palate. I checked out the tomato basil bisque, 10 oz. rib-eye steak and mashed potatoes, along with the cheesecake ~ Chocolate Pecan Bark dessert. Here's the thing when you dine at a restaurant like Ruth's Chris ~ you expect a certain level of quality in the food, atmosphere and service. And you receive it. 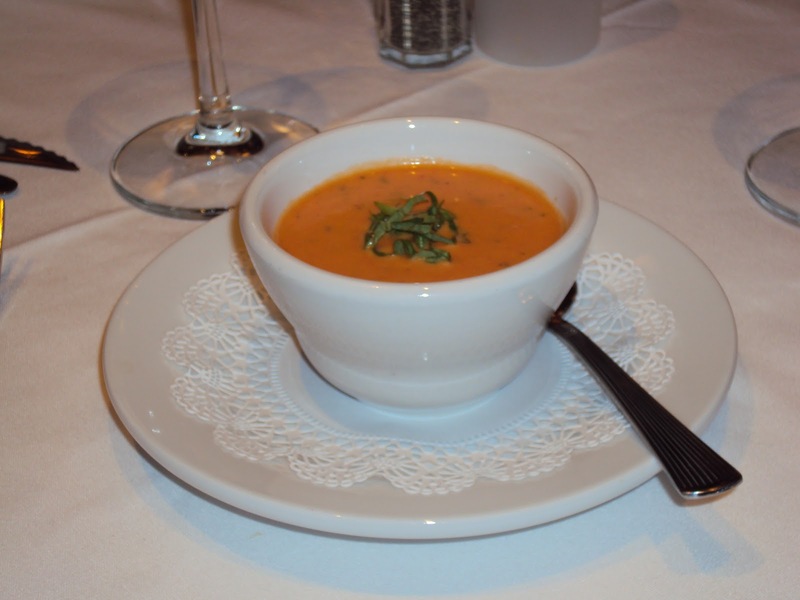 Tomato Basil bisque is a great salad alternative for a winter's meal. The steak was tender, juicy, and sizzling as it was brought to the table. 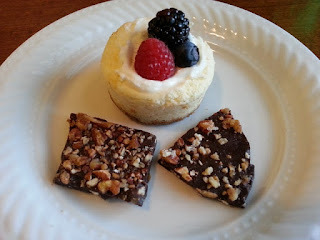 Dessert of a duo of cheesecake and Chocolate Pecan Bark was tasty enough to tempt me, but I chose to take it to go. A nice reminder of the evening's meal. At this reduced cost, this quality of cuisine and the spectacular service ~ I will most likely return during Devour Downtown...or even after. Let me know which restaurants you have tried and whether you've been, or are going, to Ruth's Chris before DD ends. Think you or your mixologist have the best recipe for a cocktail inspired by Valentine's Day? 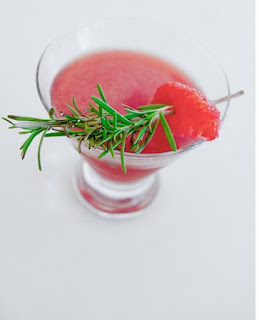 I will be featuring Valentine's Day-inspired cocktails in Gotta Go's Infused, giving readers the Top Ten best entries to enjoy and create. All recipes, images and contact information for the submission need to be in via email to elizabethjmusgrave@yahoo.com, by Monday, February 4, posting will occur the week of February 14. This will be a fun way for readers to enjoy cocktails made with great products and inspired by a romantic holiday. All entries must include images for the cocktail and all of the below information. Please remember to send the Twitter handle/link and website link. This helps the readers go immediately to you and check out how wonderful your company, bar, restaurant, et al, is and follow you on Twitter. Those chosen will be featured in Infused, on GottaGo.us, and Food Digital. E-mail submissions only are required, no physical attendance needed for this one. 5) Inspiration for drink-obviously Valentine's, but what exactly inspired you to make this particular drink? This is open to anyone within the spirits/wine/beer/restaurant realm including mixologists, bars, fine dining, bartenders, sommeliers, hotels, companies, spirit entrepreneurs, et cetera. The idea is to feature cocktails inspired by Valentine's Day and all the romantic feelings about the holiday. 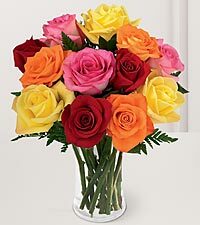 Let your imagination run wild with this one...it can go many directions: Candy hearts, chocolates, Cupid, roses, romance, lace, romantic movies or songs...you get the idea! Several cocktails were disqualified for the last Top 10 cocktail lists due to the drink name and/or inspiration missing or not applicable to the theme. Let's see your best THEMED drink! Sending in a cocktail with a non-themed name and/or inspiration will make it on the naughty list and won't make it on the nice list. January 21 - February 3 is the time frame foodies in the Indianapolis metro-area have been waiting for since last August. Devour Downtown Winterfest 2013 kicks off with more than 50 eateries around the Circle City's inner circle sharing their menus at reduced prices. While some will attempt to impress with gourmet goodies, others will comfort you this winter with the foods your mother made you as a child. The Elbow Room, 605 N. Pennsylvania St., serves up a two-for-$25 deal that will make anyone, and their wallet, pleased. I stopped in over the weekend for a quick check up on their DD menu. Although it didn't make the finals of the Signature Drink Competition, the Dream Beam martini was a blended ice cream martini that would work for dessert in a glass or after drink easily. They also offer a hot buttered rum drink which I could easily go for again and again. The Devour Downtown menu offers one appetizer, two entrees and one dessert for the fixed price of $25. Drinks, tip and tax are not included. Appetizer choices are Texas Skins, potato skins with homemade chili, shredded cheese, jalapenos, onions and sour cream or Crab-stuffed Mushrooms made and baked in house. Entrees are Pulled Pork Sandwich on Pretzel Bun with potato pancakes, Country Fried Steak, with mashed potatoes and green beans, or Spinach-stuffed Chicken Breast with baked potato and green beans. This menu is perfect for the freezing weather as a stick-to-your-ribs winter meal. An idea I like very much when the cold wind is blowing. The brandy, Jim Beam and ice cream martini was tasty and the hot toddy of buttered rum was even tastier with the buttered rum being made in house ~ no pre-mix here. The Texas skins were filling, hot and not overly topped. This is the perfect amount of food to split between two. The chicken breast meal easily could have been split also, but is meant for one. The cream sauce and spinach in the breast were a balanced amount. The angel food cake was unique with the chef's take by grilling the soft cake on two sides and topping it with fresh strawberries, glaze and whipped topping. I have never had angel food cake grilled...They have it listed as DD menu only at this point. Here's to hoping it remain a fixed item. Bottom Line: The Elbow Room's Devour Downtown menu just might be the best deal in town. Devour Downtown Winterfest 2013 has started and the usual restaurants are opening their doors for everyone to get a taste of their menus from January 21 - February 3. Some will create special menus just for the event, while others simply offer their usual food items at a reduced price. New this year is the differing prices, as opposed to years past wherein all had the $30 prix fixe menu. Now, depending on where you dine, the price could be as high as $35 (like at FOGO) or as low as 2 for $25 (like at Elbow Room). The main thing to remember is check out the links, menus and prices before venturing out. I have put an asterisk next to any restaurants I have dined at and would recommend. January 15, 2013 (Indianapolis, IN) - Easley Winery is proud to announce a gold medal win for its locally-made Traminette varietal wine at the 2013 San Francisco Chronicle Wine Competition. Easley Winery, located in downtown Indy since 1974, garnered a gold medal with its 2010 Michigan Riesling last year at this prestigious event and is excited to bring home another gold medal for Indiana's signature wine. "We love this wine!" Meredith Easley of Easley Winery states. "We are thrilled and honored to receive this award!" "We were humbled to win a gold with Traminette in three 2012 competitions, and after this amazing award, we're looking forward to a prosperous 2013," added Mark Easley, winery owner, added. Easley Winery has been no stranger to the award circuit, garnering 14 awards of gold or higher in competitions across the country in 2012, four of which came from California events. The San Francisco Chronicle Wine Competition is billed as the largest wine competition in America. With over 4,000 entries from across the country, a team of 60 industry experts are selected to judge various categories of wine from dry to sweet. Proceeds from the event go to support wine and food education at various educational institutions across California. The event organizers will hold a public tasting for all gold medal-winning wines on February 16 from 2-5 pm at the Fort Mason Center in San Francisco. For full 2013 competition results, visit WineJudging.com. Easley Traminette boasts bold floral aromas and fresh citrus flavors. This semi-dry style of Traminette is a delicious complement to Indiana pork tenderloin and should be served chilled. Traminette was adopted as Indiana's signature wine in 2009 and continues to grow in popularity. Easley Traminette can be found at Indiana Meijer locations, select Indiana Marsh and packaged liquor locations, as well as Easley Winery in downtown Indianapolis. For directions, hours, and more information on this wine or to find retail locations in your area, visit EasleyWinery.com. Always helpful, I have compiled a list of facts, tips and advice through venturing on the trail myself. 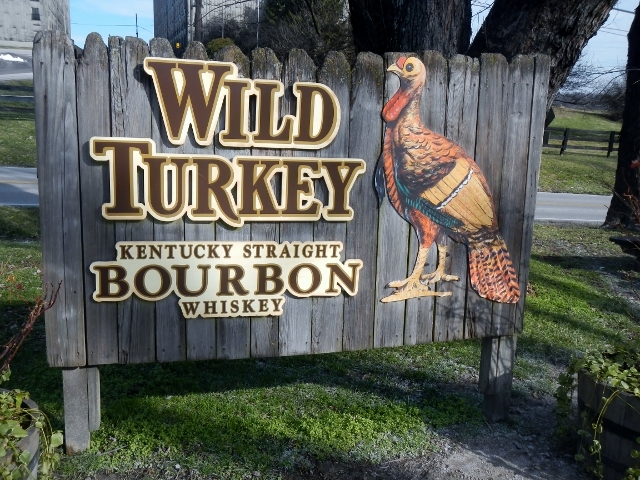 Here for you are the 10 Things to Know Before Going on the Kentucky Bourbon Trail. Cell phone service is spotty at best. If you think you can connect with the outside world while 40 miles from nowhere...you are wrong. The GPS system does not prove to be accurate. In order to not end up off in a field somewhere, go old school. Take a map and ask at distilleries, because the locals I asked weren't confident in their directions at all. You don't get that much to drink, via samples, at the distilleries. Due to laws and regulations, very small amounts are dispersed. If you want more, you will need to buy it. Trying to hit all seven locations in one day is fairly impossible, and downright dangerous. Plan on two-three days for the tours, sampling and socializing. Separate out the fun over two sections for the distilleries. One day will keep you near Lexington and the other is situated between Louisville and Bardstown. When going to the part of the tours around Lexington, visit Woodford Reserve first thing in the morning. Most visitors save it to last and the afternoons are always busier, according to the local experts. Hit it first thing and avoid the crowds. 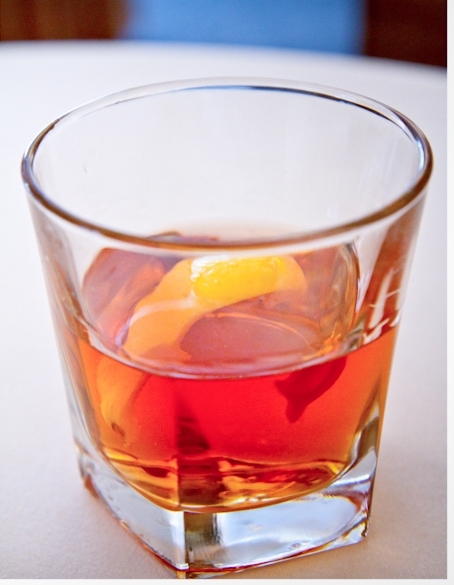 Plan on an extra day, or two, and hit the Urban Bourbon Trail in Louisville. 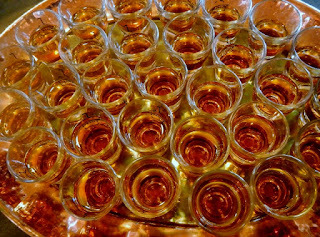 It's a fabulously fun time filled with restaurants, bars and pubs dedicated to all the splendor of bourbon. They live it, breathe it and love sharing the information and bourbon knowledge with everyone. There is pretty much nothing you can think of that isn't made with bourbon in Louisville. Entrees, sauces, cocktails, even ice cream and brownies are whipped up, baked and blended with the golden amber that makes this state happy. Visit in the spring and autumn for the prettiest photo opportunities, and winter for fewer crowds and plenty of distilling happenings. Summer time is fine for visiting, but most locations halt distilling for a month or two during the hot months, so if you want to definitely catch corn mashing practices, go during the other three seasons or call ahead to every distillery. There are actually three trails: Kentucky Bourbon Trail, which includes the seven big guys; Urban Bourbon Trail, for the Louisville style of bourbon fun, and Craft Bourbon Trail, which includes small, boutique distilleries. Think you or your mixologist have the best recipe for a cocktail inspired by Valentine's Day? I will be featuring Valentine's Day-inspired cocktails in Infused, giving readers the Top Ten best entries to enjoy and create. All recipes, images and contact information for the submission need to be in via email at elizabethjmusgrave@yahoo.com, by Monday, February 4, posting will occur the week of February 14. This will be a fun way for readers to enjoy cocktails made with great products and inspired by a romantic holiday. Those chosen will be featured in Infused, on GottaGo.us and Food Digital. E-mail submissions only are required, no physical attendance needed for this one. Please send an email for shipping address if sending samples. This is open to anyone within the spirits/wine/beer/restaurant realm including mixologists, bars, fine dining, bartenders, sommeliers, hotels, companies, spirit entrepreneurs, et cetera. The idea is to feature cocktails inspired by Valentine's Day and all the romantic feelings about the holiday. Let your imagination run wild with this one...it can go many directions: Candy hearts, chocolates, Cupid, roses, romance, romantic vacation spot with your sweetheart, lace, romantic movies or songs...you get the idea! (Ex. sending a chocolate martini with the liqueur brand as the name or stating it is inspired by your love of chocolate has nothing to do with Valentine's Day. 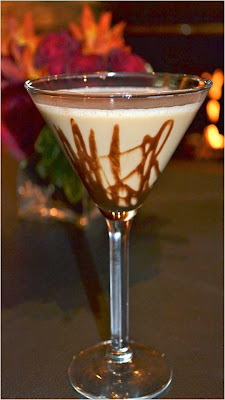 However, a chocolate martini with a heart-shape floating in it ~ named and inspired by Godiva chocolates ~ would work. Feel free to email or call with questions and comments. Elizabeth J. Musgrave is a syndicated fine-living, travel columnist, freelance writer, photographer, and performing arts and restaurant critic for Gotta Go. Read Infused, her spirits, wine & beer lifestyle column, at www.GottaGo.us and www.FoodDigital.com and catch her as Indy’s Entertainment Adviser on 93 WIBC. Gotta Go is published on www.Gottago.us, www.BroadwayWorld.com, and in print. Follow her on Twitter @GottaGo, LinkedIn and Facebook. INDIANAPOLIS – For the 13th year in a row, visitors to White River State Park attractions will receive free admission and free parking on Martin Luther King Jr. Day, Jan. 21, with a canned good donation (one can per person, per attraction). Visitors can walk the grounds and see lots of animals, especially the ones that love the cooler temperatures. Favorite activities include the 10:30 a.m. and 2:30 p.m. dolphin shows, indoor shark petting in the nation’s largest shark touch pool and heating things up with the meerkats in Deserts Dome. Born To Be Wild and To The Arctic will be shown for free until 5 p.m. Born To Be Wild follows young orphaned elephants and orangutans on the trip of a lifetime, from birth to their rebirth into the wild. This family friendly documentary transports moviegoers around the world to the far stretches of Kenya and Borneo and inspires them to take action and save earth’s precious creatures. To The Arctic is an emotional, kid-friendly story of love, family and hope. Captivating and intimate footage brings moviegoers up close and personal with this family’s struggle to survive in a frigid environment of melting ice, immense glaciers, spectacular waterfalls, and majestic snow-bound peaks. Warm-up with a complimentary cup of hot chocolate or coffee and learn more about what it takes to be an NCAA student-athlete. Ronald Nored, a former basketball student-athlete from Butler University will be on hand from 11 a.m. to 2 p.m. and will have a storytime for children. There will be continuous screenings of "Game of Change," a documentary that reaches far beyond sports, demonstrating the significance of the game of basketball in the struggle for racial equality. There will also be opportunities to win official NCAA merchandise throughout the day. Films, activities, poetry and performance art fill the museum as the life and times of the great Dr. Martin Luther King, Jr. are celebrated. “Tragedy, Trains, Truth & Tales” will be performed by Arts for Learning actors as part of the Indiana Affiliate of Young Audiences. And, in celebration of the 150th anniversary of the Emancipation Proclamation, visitors can view original signed copies of the Emancipation Proclamation and the 13th Amendment, which outlawed slavery. The Canal Café and the historic L.S. Ayres Tea Room will be serving lunch; reservations recommended for the Tea Room. 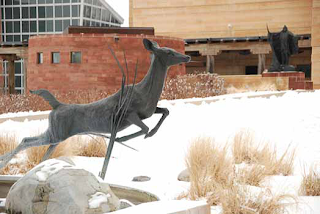 Visitors can immerse themselves in Native American and Western cultures with the museum's many exhibits. Don't miss your chance to visit National Geographic: Greatest Photographs of the American West. The exhibit features the best images of the West published by National Geographic over its 125-year history and includes works by nearly 80 photographers including Ansel Adams, Edward S. Curtis and Annie Griffiths. And be sure to check out the lunch specials at the Eiteljorg Museum Cafe. From 11 a.m. to 2 p.m., health care professionals from Wishard will offer health screenings and general information about Wishard services. Nurses will also be available to discuss the importance of primary and preventive care. Health screening participants will each receive two free tickets to Opening Day at Victory Field (April 4). Plus, Rowdie, the Indians mascot, will stop by for autographs. The Park is also offering complimentary parking on MLK, Jr. Day. Visitors may park in the underground garage located off Washington Street in front of the Indiana State Museum, in the surface parking lots at the Indianapolis Zoo and Victory Field, and in the surface parking lot across from Victory Field next to the Park's Visitor's Center. Parking is not guaranteed and is on a first-come, first-served basis. The Park’s partnership with Gleaners Food Bank of Indiana has resulted in more than 75 tons of non-perishable, canned food donations over the years from this one-day, annual event. That weight of food is the equivalent of approximately 28 zoo elephants, or 15 mastodons that once roamed Indiana, or 150 western horses, or 468,000 professional baseballs, or 273 full-length IMAX movie reel platters, or 109,000 collegiate-level basketballs. For more information about White River State Park, visit WhiterRverStatePark.org. Indianapolis, Ind., Jan. 10, 2013 – Indianapolis-based Centaur Holdings, LLC received the Indiana Gaming Commission’s conditional approval today of its agreement to purchase Indiana Grand Casino and Downs in Shelbyville, Ind. The state commission’s unanimous decision, the second of two state-level regulatory approvals needed, comes after last month’s Indiana Horse Racing Commission endorsement. A final review by the Chairman of the Indiana Horse Racing Commission and several financing and federal regulatory and legal approvals will complete the purchase. Centaur, founded in 1993, is a privately owned company, managed by Hoosiers and headquartered in Indianapolis. “The commissions’ concurrence is a sign of confidence in the Centaur management team’s experience and knowledge in creating quality entertainment experiences for our customers,” concluded Ratcliff. Indiana Grand Casino and Downs, located in Shelbyville, Ind., opened its racetrack, Indiana Downs, in December 2002. Indiana Grand Casino, formerly Indiana Live!, opened to the public in June 2008. Indianapolis-based Centaur Holdings, LLC focuses on bringing the entertainment and economic benefits of casino gaming and horse racing to key communities across Indiana. Centaur currently owns and operates Hoosier Park Racing & Casino in Anderson, Ind., Hoosier Park’s Winner’s Circle Pub, Grille & OTB in Indianapolis, Ind. and off-track betting facilities in Fort Wayne and Merrillville, Ind. 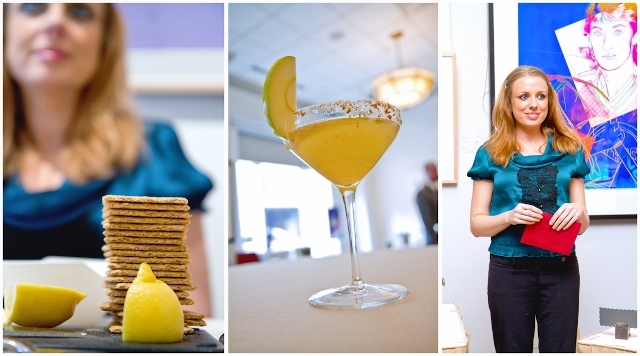 The Signature Drink Competition has been shaken, stirred and judged and the results are in. Vying for the top drink for the Devour Downtown event, bartenders and mixologists muddled, garnished and poured their own secret recipes for the judging panel. The competition was held at The Conrad, Indianapolis. Three category winners and one Best of Show were named. Indianapolis readies for two things in the winter, cold weather and Devour Downtown. The biannual event continues its tradition of offering menus at a reduced cost from Indianapolis-area restaurants. The eating fest, which takes place each winter and summer, has become a mecca for foodies ~ many who attempt to hit each eatery. The 2013 Winterfest runs from Jan. 21 - Feb. 9, and includes almost 50 eateries in the downtown area. The three categories' liquors, Jim Beam, Sailor Jerry and Grey Goose, are required as the main ingredient in the new recipe, created specifically for the Devour Downtown event. Recipe: 2 oz. Jim Beam Bourbon, ½ oz. Goldschlager, ½ oz. apple juice. Add graham cracker crumbles around rim the rim of a martini glass. Combine ingredients into shaker. 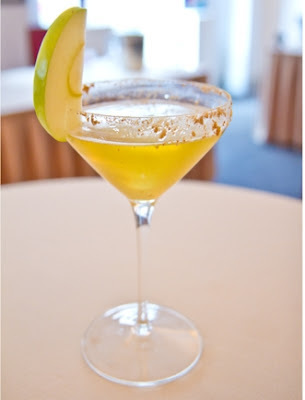 Shake and serve with apple garnish. Recipe: 2 oz. Sailor Jerry Rum, 2 dashes Peychaud's Bitters, 1/2 oz. Simple Syrup, ¼ oz. Absinthe, lemon peel garnish. Fill highball glass with ice to cool it. Build all ingredients except Absinthe in pint glass and stir contents. Empty highball glass and pour in Absinthe to line the glass. Dump extra Absinthe. Pour ingredients into highball and garnish with the lemon peel. Recipe: 2.5 oz Grey Goose Vodka, 1.5 oz Solerno Blood Orange Liqueur, 1.5 oz Pom Juice, 3 wedges of blood orange, 1 Rosemary sprig. Muddle the blood orange with Solerno. Add Grey Goose Vodka and Pom Juice. Shake and strain into a martini glass. Garnish with blood orange and torched Rosemary sprig.